When Jeanie Buss needed to press the reset button on the Los Angeles Lakers, she went full Khaleesi mode. She ousted her brother, Jim, as the team’s executive vice president of basketball operations and fired longtime general manager Mitch Kupchak. Then she hired her father’s favorite player of all-time, Magic Johnson, to be the president of basketball operations. The face of the Showtime Lakers was now tasked with rebuilding the Lakers brand. Magic needed a sidekick. Not just any sidekick. Someone who is well connected with today’s game and today’s players. Before Pelinka, 48, became a sports agent, he was best known as a role player on the Michigan Fab Five team that dominated college basketball for two years. After ditching the basketball sneakers for Florsheim shoes, Pelinka became a big-time player in the sports agent world. His biggest client was none other Dr. Jerry Buss’ second-favorite Laker of all-time, Kobe Bryant. Pelinka personally handled player contracts and had a good feel for how the NBA salary cap worked. He was the perfect numbers guy to help Magic clean up the bad Laker deals Jim Buss and Kupchak had accumulated in the post-Kobe era. Luol Deng’s four-year, $72 million contract remains one of the great mysteries of our time. Jeanie Buss hired Pelinka to be the Lakers’ general manager, and now she had her two-headed monster to save Laker Nation. If Jeanie is the mother of dragons then her two main dragons, Magic and Pelinka, have been breathing fire these last 17 months because the Lakers are not only relevant again, but they are breathing down the necks of the current elite teams in the NBA. When the NBA free agency period began at 9:01 p.m. PDT on June 30, Magic Johnson was camped outside LeBron James’ Los Angeles house at 8 p.m. PDT. He was a full hour early, so he sat and waited in his car just to make sure he didn’t break league policy. The 58-year-old basketball Hall of Famer knew the importance of this meeting. His meeting with LeBron not only could change the course of the Lakers franchise but it could also accelerate his three-year master plan. Before he came through the gates of LeBron’s mansion, Magic did his homework. He studied film of LeBron’s games, going back to his early days in Cleveland, to his four-year stint in Miami, then back to his last four years in Cleveland. Magic didn’t want to leave any stones unturned. He didn’t want the same mistakes the Lakers made in recent past when they couldn’t even get a meeting with big-name free agents because the franchise was in such disarray. For three hours, Magic and LeBron talked basketball. Strictly basketball. No fancy video pitches. No power point presentations. Just two basketball junkies talking about the game they love. Pelinka says the Lakers aren’t trying to beat the Golden State Warriors at their own game. Instead, they’re building a team around LeBron James to do something different. Yes, LeBron James is now a member of the Los Angeles Lakers. It still feels like a dream, but it is for real. 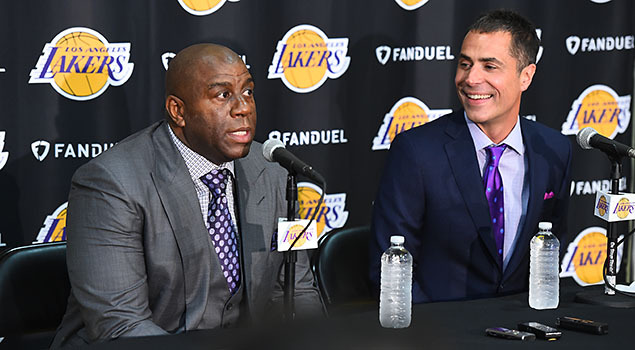 LeBron signing a four-year deal with the Lakers is the culmination of a well-orchestrated plan set in motion by Magic and Pelinka back in early 2017 when they began putting together the pieces of a potential championship puzzle. When Pelinka spoke publicly for the first time since the Lakers’ remarkable offseason overhaul began, he was beaming. He was excited about the future. The longest postseason drought in franchise history could be finished after James chose the Lakers in free agency. The club also added veterans Rajon Rondo, JaVale McGee, Michael Beasley and Lance Stephenson alongside their talented young core led by Lonzo Ball, Brandon Ingram, Josh Hart and Kyle Kuzma. Ball and Ingram are both 20 years old, while Hart and Kuzma are 23. Pelinka and Magic hope the result is a long, athletic, defense-minded team with enough up-tempo offense to compete with the Warriors and Houston Rockets in the Western Conference. Pelinka said the Lakers focused their free agency recruitment efforts on versatile, playoff-tested talents who can score and defend, instead of looking for elite players with only one specialty. He hopes the result will be a flexible, dangerous team under coach Luke Walton. It’s a different look around James, whose Cleveland Cavaliers teams often looked like a collection of perimeter shooters whose deficiencies were exposed by Golden State. Pelinka’s desire for flexibility extended to the payroll as well. After years of trading away draft picks and acquiring high-priced veterans in an effort to win now with Bryant, the Lakers were overextended until Pelinka and Johnson spent the past few months creating enough salary cap space to sign two elite free agents. No matter what happens, Pelinka said the Lakers’ series of one-year contracts around James will put them in position to have ample cap space again next summer, when several stars could be available to join James. Pelinka said the Lakers will have “an open training camp” in September, with only James guaranteed to be a starter. In order to properly rule a kingdom, you need a king, a queen, a trusted adviser who knows the lay of the land, and a little bit of magic. The Lakers appear to have all of them.